A tale of two horses... One, a beloved Irish Draught cross thoroughbred, euthanized recently when his old body finally gave out; the other one executed in the prime of his life and butchered as a taunt to animal activists opposed to horse slaughter. Horses need your help and they need it now. It doesn’t matter if you’re not a “horse person”–you’re an animal person, and this domestic animal needs 10 minutes of your time, my time, our time. More on that in a moment, but first, a tale of two horses. 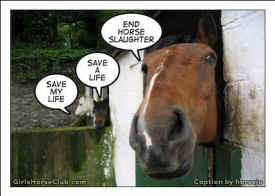 One, a beloved Irish Draught cross thoroughbred, euthanized recently when his old body finally gave out; the other one executed in the prime of his life and butchered as a taunt to animal activists opposed to horse slaughter. Shayne was living the good life at Remus Memorial Horse Sanctuary, near Ingatestone, Essex (Great Britain) when, at 51 years old–120 in human years–his old legs gave out and he collapsed. He was euthanized and cremated and will find his final resting place at the sanctuary where he enjoyed a comfortable retirement (video). Said the founder of the 40-acre sanctuary, “Shayne was a happy horse, a lovely old boy and we are proud to have known him…we shall miss him dearly”. No matter the target animal or the weapon, the speciesist impulse to slaughter other beings is one of humankind’s uglier characteristics; it’s never good for animals and it’s never “humane” (see HumaneMyth.org). Anti-slaughter horse people–they don’t necessarily define themselves as animal rights proponents or vegans–offer many valid reasons to oppose horse slaughter. 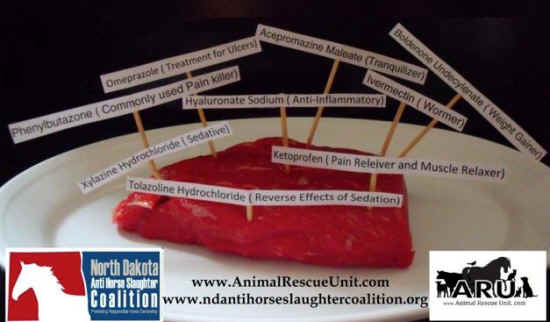 Among them is the fact that horses aren’t raised as food animals, hence they are given a smorgasbord of drugs, many unsafe for human consumption. 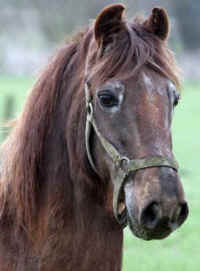 Then there’s the idea that horses are more companion than livestock, that we owe them the same loyalty they’ve shown us. You can easily imagine the same thing being said about dogs were dog slaughter to be proposed. It behooves animal rights activists, vegans, and anti-slaughter horse folks to join forces on this one. Sure, as vegans, we see little difference between the slaughter of pigs and the slaughter of horses–sentient beings, both. Does a pig think and feel less meaningfully than a horse? Love her babies less? Suffer less? But when given the opportunity to keep an entire species out of the slaughter loop, why wouldn’t we grab it?!? Here’s where those ten minutes for horses come in. The bi-partisan SAFE Act (Safeguarding American Food Exports Act of 2013: Senate version S. 541; House version, H.R. 1094) can shut down–with federal legislation–the states’ movement toward re-instituting slaughter. On the outside chance that you need help finding your three elected federal officials, here’s a really quick and easy resource: Contacting the Congress.org. It took me less than 30 seconds to come up with message form links and phone numbers for my two senators and one representative. Call ‘em, fax ‘em, or e-mail ‘em. Tell them you oppose horse slaughter anywhere in the U.S., insert your own personal reason if you wish, and ask them to support the bi-partisan Safeguarding American Food Exports Act of 2013 that would ban the slaughter of horses for human consumption in the US and prohibit transporting them to other countries for the purpose of slaughter. If you’d like to know if either your senators or representative have already signed on to the legislation as co-sponsors, check here for Senate co-sponsors and here for House co-sponsors. If you find their names there, lucky you! Contact them anyhow and let them know you support their effort. Perhaps you’re familiar with the nauseating manner in which pro-slaughter people discuss this issue–referring to “unwanted horses” for whom there’s no solution but “humane harvest.” If horse breeders would take a look in a mirror, they’d see both the problem and the solution–at least a substantial part of it.